Kangaderoo Custom QR Code. : QR Code Trailers. Quote from the movie A Beautiful Mind: "But on the night, here you are, making a Hollywood movie..."
There are just a few movie poster, or other movie related promotional material that hold QR Codes. The Iron Man II movie poster contained a QR Code in the Uni-Beam of the Iron Man suit. This QR Code was linked to a online promotion. I haven't found a Iron Man III movie poster containing a QR Code, it seems that the usage of QR Codes in relation with movies is not consistent. 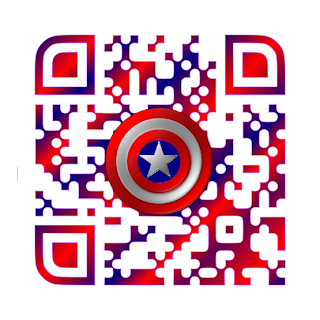 In my opinion each modern movie poster should contain a QR Code linking to the trailer. QR Codes target the mobile phone users, and most modern mobile phone have no problem running these trailers. With just a bit of enhancement effort the QR Code can be graphically linked to the movie.